You can trust Locks & Keys to provide you with 24 hour emergency locksmith service every day of the week, day and night. Our team of lock and key professionals are standing by to help you with any security lock out problem you might have. Our locksmiths in London can handle any residential and commercial emergency, including property and auto lockouts, lock and door repair and replacement, re-keying and more. When you have an emergency, it may not be possible to wait for normal business hours. 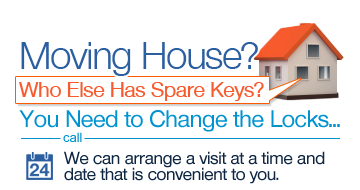 Locks & Keys understand that and work hard to provide a service that will be available to you anytime. Help if you are locked out - if you have lost your keys or if you have shut the door behind you and the keys are still inside, our experts can lock pick your door lock with minimal damage to the door and lock. Burglary repair including door frames - installing a new door is never cheap. Our technicians will try to minimise your expenses and make sure your property is safe and secure once more. Replacing broken keys and locks - a jam in the door lock always happens at the worst time, you must leave the house but you can't lock the door, what should you do? Locks & Keys emergency team will reach you quickly and take care of the jammed locking system in a matter of minutes. Window and door repair - broken windows are a security threat to your property, in order to protect your belongings call us for the repair. Security bars installations - another way to protect your property and your loved ones, is to install security bars on your windows. Home security locks and keys - your outer door locks need to be of a high quality, so we can help you choose a good lock for your needs from a trusted manufacturer. Auto lockouts - to find yourself locked out of the car can be very stressful, our emergency service is there for you day or night to get you back into your car and on the road as quickly as possible. Broken car keys & transponder locks - in case your car key is giving you a hard time, don't wait until it breaks, replacing and reprogramming a car key nowadays is quite a simple task for a professional. Re-keying solutions - the advantage of re-keying is it doesn't actually require a lock replacement, the security expert just changes the inside of the lock so that it will only open for a new key. You can rely on our locksmiths in London for professional lock and key services because we train our technicians with the latest security equipment and tools, giving them the upper hand when it comes to opening locked doors and reinstalling locks and keys. We ensure that our technicians regularly attend up to date training and we use the latest security tools and supplies available on the market today. We can guarantee a fast and professional service. Call us for 24 hour emergency locksmith service throughout Greater London and the City of London. Opening locks quickly without damaging them is a skill employed by experts. To get your door open fast and without any hassle, call our locksmiths on 020 3598 4627.